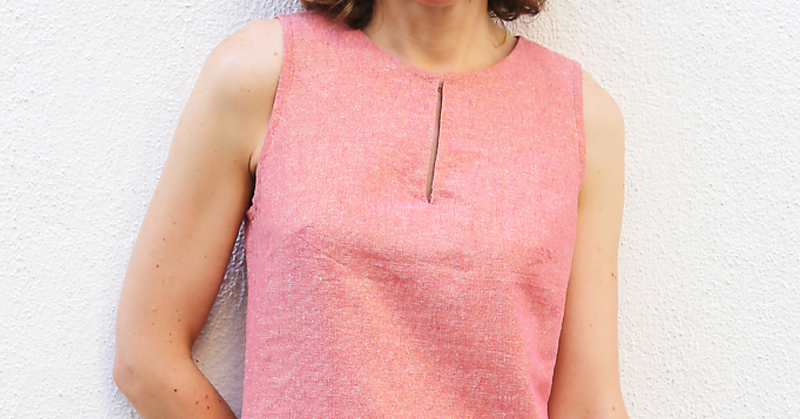 Remember that amazing metallic Essex linen/cotton fabric I used for my Lisette for Butterick B6464 sleeveless top? Here’s the project that I used for the fabric that was left over. I finished this months ago and never got around to showing you. It’s another modification to the Liesl + Co. Bistro Dress pattern. You might remember my previous modifications to the pattern here and here. 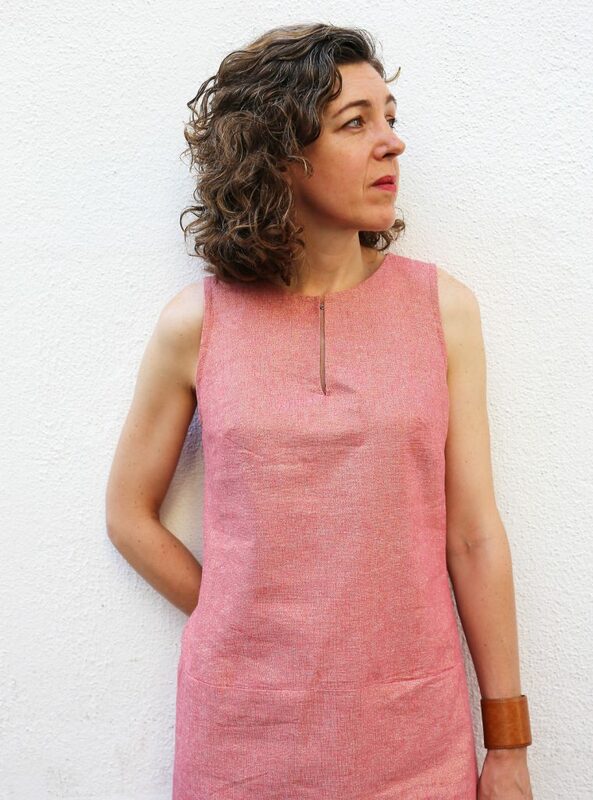 For this dress, I removed the sleeves and reshaped the armholes to trim some fabric from the shoulders. To do this, I always prefer to draw directly on the muslin so I can be sure I like the shape and I’m still covering my bra straps. Then I use a French curve to re-draw the armholes and use the sleeveless bias-faced armhole technique from page 68 in the Building Block Dress book to finish them. Easy-peesy, and it doesn’t show from the outside. I shortened this dress quite a bit from my first two dresses, and now I’m regretting that decision a bit. I think I could use a couple more inches on it, but I was feeling very ready for summer when I sewed this back in March. The gold metallic threads in this Essex yarn-dyed metallic from Robert Kaufman don’t show up better in these photos because they really give the fabric a lovely glow. This is the Dusty Rose colorway, which I fell in love with when I first saw it at Quilt Market last fall. It also comes quite a few additional colorways including an aqua blue that’s called Water, which is equally pretty. Keep your eyes open for this fabric: Essex metallic is 50% linen, 40% cotton, and 10% lurex, so the metallic won’t wash away. I just love it. Just for the fun of it I added a little hook and eye at the inside of the neckline so it can be closed almost invisibly. I like how it works out because it makes the neckline convertible. You can pick up your own copy of the Liesl + Co. 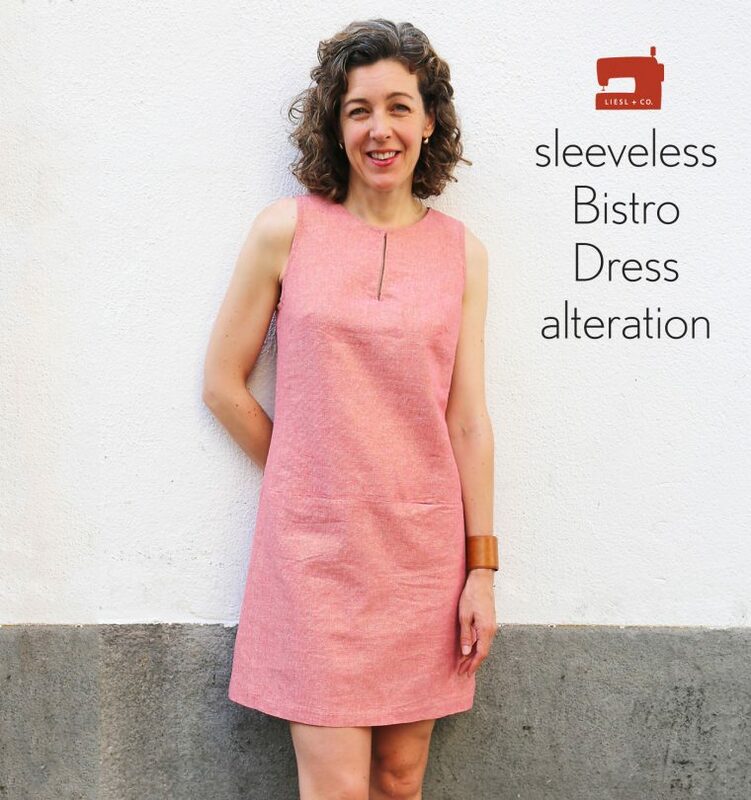 Bistro Dress pattern in either paper or digital format. My tutorial for altering the dress pattern to create this silhouette is right here. I hope you’ll show us if you make one! Tag it #lieslandco and #bistrodress on Instagram so we can find it! So beautiful! Love the hook and eye. I will definitely be on the look out for water! Thanks! The sandals are very old, and I’m searching for a replacement since they’re starting to fall apart. Hi. I just started sewing and fell in love with this dress. I’ve made my muslin and altered it, according to your AWESOME book and pics in the previous mods. It fits, with ease.Thank you. Two queries. I’m using Essex linen, do I need to line it? My muslin isn’t really comfortable and I’m concerned about stickiness down under. We’re going into summer. How do I make the sleeve hole a wee bit looser. It fits beautifully on top, but is a bit uncomfortable under my arm. Thanks again for a beautiful pattern and an Excellent resource in your book.